Products of the domain : Château Doisy-Daëne. At the beginning of the 18th century, Jean Védrines acquired an estate located at the place called "Doysy", at any loan from the hamlet of La Pinesse in Barsac.But following the application of the Napoleonic laws, the estate is divided into three: Doisy -Védrines, Doisy-Dubroca and Doisy-Daëne. Doisy-Daëne as the other two estates were classified Second Classified Growth in 1855. Reconstituted for the most part in the 1950s, the vineyard of Doisy-Daëne has vines of about sixty Year. Its surface is today 18.2 ha, associating the Sémillon (86%), Sauvignon (14%) implanted on clay sands soils and limestone subsoils, very characteristic of the plateau of Barsac.Le terroir Of the vineyard receives no herbicides and is maintained in the most traditional manner. 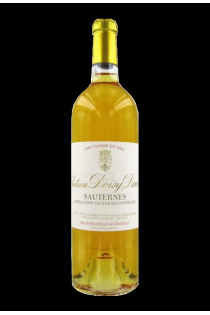 Doisy-Daëne Second Classified Growth in 1855 produces both a great Sauternes wine and a dry white Bordeaux called Grand Vin Sec from Château Doisy-Daëne. Two exceptional cuvées. Château Doisy-Daëne Grand Vin Sec - 2010 - Château Doisy-Daëne. Château Doisy-Daëne Grand Vin Sec - 2014 - Château Doisy-Daëne. 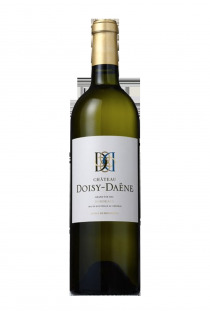 Daëne - 2010 - Château Doisy-Daëne.